You may not know the name Dave Dorman, but if you've seen any of the Star Wars media like comic books, novels, or even the original Star Wars game Dark Forces II: Jedi Knight, then you've seen his work. Dorman is an artist most well-known for his photo-realistic work in science fiction illustration, such as the covers for Star Wars media, but he's done a whole lot more. 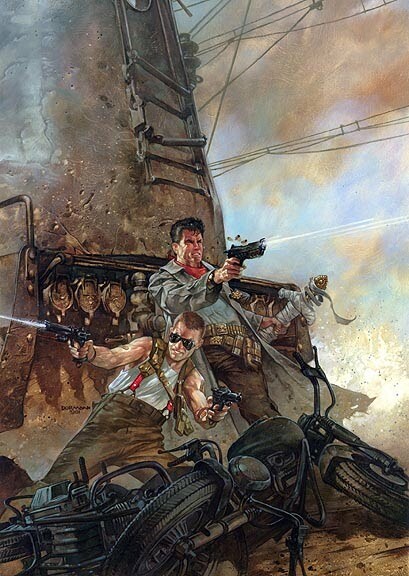 Illustrating covers for comic books such as Indiana Jones, designing toys for Alien: Resurrection, creating his own original property with a steampunk adventure series called The Wasted Lands...the list goes on and on. He'll be a featured guest at the upcoming San Diego Comic-Con on July 24 and 25, and we got the opportunity to conduct our own Q&A with Dorman by email. We could finally ask some of the burning questions about his new book Rolling Thunder: The Art of Dave Dorman, his work designing the first Predalien, and who would win the fight between Batman and Darth Vader. Q: I'd be interested to hear how you first got involved with drawing covers for Star Wars properties. How did your partnership with Lucasfilm get started? A: I started doing Dark Horse Comics covers for Indiana Jones, and when I heard they got the Star Wars license, I asked to be cover artist and they granted me that opportunity, for which I will always be grateful. Lucasfilm really liked the work I did for Indiana Jones, and that kicked off my relationship with them. When I asked to do the Star Wars covers, there were no objections on their side. Q: I understand that George Lucas himself is a fan of yours and purchased ninety of your original paintings. Did the pieces he chose to buy give you any insights on how he views the series? A: George is both a fan and collector of art in general, not just for Star Wars. I believe part of the reason he collects my work is to build the Star Wars archives of quality art that has been used for the license, but part of it is also his enjoyment of the art for art's sake. He owns more than 90 of my original oil paintings. Q: Your forthcoming book Rolling Thunder: The Art of Dave Dorman looks like it's going to be an immense retrospective of your career. What was the goal with the book, other than just compiling material for your fans? Q: When you take a look back at your career and work in a project like this, what jumps out at you? Are there any common themes that you detected? A: Well, my career took a turn when I started working with Dark Horse doing covers for licensed material--Aliens, Predator, Indiana Jones, Star Wars. After that, I became known as someone in the industry who could handle licensed material very well, so that was a turning point for high profile licensed characters. Q: In your blog, you discuss how the final designs for the Predalien in Alien vs Predator: Requiem bear a strong resemblance to your early designs for Alien vs Predator in the mid-nineties. I'm interested to hear more about your experience working with Fox on the project. Can you expand on that? A: They asked me to design a creature for what was supposed to be the original Aliens v. Predator movie and so I produced a series of drawings and a painting for them as work-for-hire. The project was shelved, and all of my artwork went into their files. Q: I'd like to hear more about your approach designing the Predalien. What elements did you feel you had to keep of both characters and what did you feel could be left out? A: They are both humanoid in their basic structure. Obviously, the heads are different, so I wanted to keep the recognizable elements of both head designs and try to work them together for the creature. Then it was just a matter of taking bits and pieces, like you would mixed breeds of a dog, where you would recognize elements within the creature, but not necessarily be more one breed than the other. Q: Your painting of "Batman vs. Darth Vader" is all kinds of awesome, and (from the buzz on the web) extremely popular. What was the inspiration for the painting? A: I was working on both Star Wars: Episode VI and a Batman project at the same time. As I was working on both projects, I thought it would be really fun to do a piece with both of the main characters - Star Wars and Batman. Q: It made me try to imagine the scenario that would bring these iconic characters together. I mean, if Batman can fight the Predator, he can fight Darth Vader. As a writer, I couldn't help imagining a story where Vader's Imperial Destroyer gets pulled through a time warp and ends up over Gotham City. Vader tries to conquer Gotham and Batman battles him to save the city. Are there any plans to make the painting into a full-fledged comic or graphic novel? A: No - from a licensing perspective, it would more than likely be a nightmare and never get through the layers of lawyers. Q: So who would win that fight; Darth Vader or Batman? A: The answer to that question will go to my grave. Q: That painting also made me wonder how it works when you make an original painting based on existing properties. Is that painting for sale? Q: Do you have to buy the rights from DC Comics for Batman or Lucasfilm for Darth Vader? A: I'm allowed to paint one-off original pieces with the characters as long as I have no intent of making prints or using the piece as a profit-making venture. Q: Are there any limits on what you can do on your own work for private sale? A: For private commissions, there are no real limits other than what my clients and I decide upon. Q: I'm a huge fan of steampunk and love your work on The Wasted Lands. It's a great combination of strong visuals and mind-blowing concepts. When you developed the idea, which came first - the visuals or the story? A: The visuals came first. I developed a set of characters for a separate project. I eventually pulled the more interesting characters out and built the Wasted Lands world around them. Q: It seems like Wasted Lands is a property that spans many different media. You've got a graphic novel, webcomic, novels, a calendar, and a potential movie. What was your original plan for Wasted Lands when you came up with the idea? A: It was basically wanting to make my single mark in doing a graphic novel. Being a fan of comics all of my life and my career taking me into doing single illustration work, I really wanted to show that I could do a project within the medium that I've loved and grown up in - sequential art. As I was working on it, I realized it had the potential to become so much more than a single piece. I've spent the past 10 years developing it. graphic novel or even a regular comic series. A: Absolutely. There are plans and it's just a matter of finding the right publisher and making the right deal for the material to be produced. Do These Pics of Oliva Munn Prove She's Hot?